“All Hands on Pet!” by Susan E. Davis is a must-read resource for pet owners. It is listed as a cross-reference to “Physical Therapy and Rehabilitation for Animals: A Guide for the Consumer,” which I do not have at this time, however, I plan to get it soon! I have five aging rescued canines, ranging in age from 5 to 14 years. I currently give them massages and Reiki, but I want to learn more, so that I can keep providing preventative care. 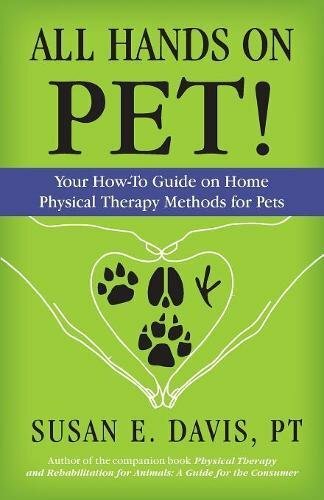 I was so happy to find this resource because the author has a great deal of experience in physical therapy and currently has a business which provides physical therapy services to animals. While the main focus of the book is on cats and dogs, she also covers treatment for other animals including, birds, reptiles, rabbits and cows. While I have no need for information on how to take care of anything but dogs, I found it fascinating to read about other animals. I had no clue that reptiles could get gout! I also appreciated the heartwarming case studies about individual pets that had had health issues. “All Hands on Pet!” is well organized into different sections. The author presents a comprehensive discussion about various physical therapy treatment options for our pets. I previously had no clue that so much was available for them! I love that the age of the pet is broken into different sections so that issues are addressed separately, yet still cover puppyhood, adulthood and when they are seniors. While it is incredibly difficult to watch my pets age, I feel relief in knowing that I can do something to help them age properly. I have a rambunctious blue heeler that is beginning to limp at night. I look forward to trying more techniques on him. I know that his play time needs to be reduced and made so that he will not jump around like he used to, but now I feel like I can do more for him. I think “All Hands on Pet!” by Susan E. Davis is an excellent resource for animal lovers and look forward to reading her companion book. I hope to get started on a healthy treatment plan to keep my fur babies as pain free as possible!